Let’s look at each of these items in more detail. If you’re wondering how many places you’ve used a style or button bar … or any new FileMaker 14 features, then InspectorPro has you covered. 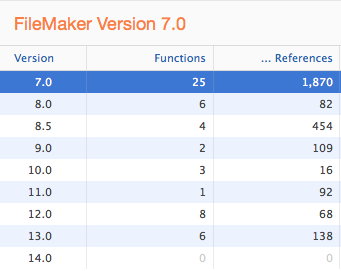 In the FileMaker versions area you can discover what the minimum required version needed for your solution is. Ever wonder what percentage of your fields, layouts, scripts or anything else in your solution is referenced (meaning in use) vs unreferenced (meaning you could safely delete it)? Now on the top right of every window there are 2 donut pie chart visualizations that help you see this information at a glance and have tool tips associated with them. The new visualization gives you a quick glance at referenced and unreferenced items and problems, helping you see the big picture immediately. When you hover over the visualization you’ll get a tool tip with information on script reference and problems. This helps you see all the elements of your solution in one simple view. If you have multiple solutions then this also helps you zero in on a particular area. Clicking on fields for a particular database will display fields for that database alone. Likewise if you have problems and want to focus on problems for fields in that database you could isolate those problems immediately. Especially important for users with really old solutions, this helps you know when you have some invalid characters that have managed to get into your solution so you can weed them out. Find out more about InspectorPro, download a demo, or order now.